Good things come in midsize crossover SUV packages and the Honda Pilot is a case in point. With choice features and room for everyone you love, including your furry friends, its tagline could be "the more the merrier"! 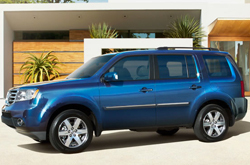 The 2015 Honda Pilot in Phoenix fits eight, rides smooth and conserves fuel very well for an SUV. With its commodious and comfortable interior, it feels like a larger utility vehicle. 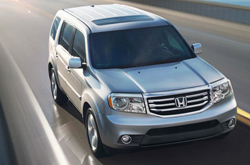 However, its "tidy exterior proportions make it easy to maneuver through cramped parking lots and rush-hour traffic," according to Kelley Blue Book's 2015 Honda Pilot review. If you shop at Costco or buy in bulk at your local grocery store, Pilot's cargo area will be a lifesaver, offering plenty of space and ways to carry bags and boxes. On the flip side, when you're not packing in cargo, there's an abundance of space for passengers, and unlike some competitors Pilot's third row is actually roomy enough for adults. A midsize SUV known for providing plenty of family fun, the 2015 Honda Pilot in Phoenix doesn't disappoint when it comes to features. To reduce chances of a collision occurring, every trim level in the Pilot lineup (LX, EX, SE, EX-L and Touring) comes standard with a rearview camera. And the SUV offers "functional fun" not only with its versatile seating layout, but also with standard amenities like a Bluetooth Hands-free Phone system, Bluetooth Audio Streaming and an iPod/USB interface. The 2015 Buick Enclave, GMC Acadia, Chevrolet Traverse, Hyundai Veracruz and the Mazda CX-9 are outdone by the 2015 Pilot in quite a few areas. If the Pilot's unique incar technologies and superb exterior styling don't convince you that it's the ideal vehicle for you, we're sure its cut-rate cost will. 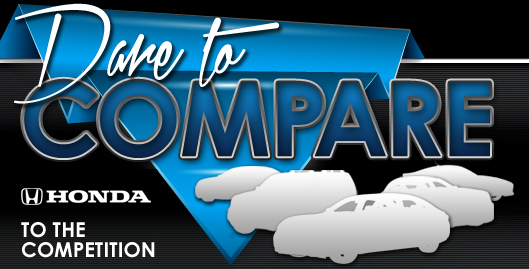 Hundreds of Phoenix Honda drivers choose it because it's a fabulous value; just compare its price to the aforementioned vehicles. The bullet list underneath this text will give you even more details! 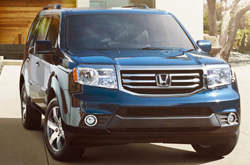 Do you want to know more about the 2015 Honda Pilot's features and specs? After reading the review above, visit Bell Honda and experience the Pilot up close. As the prominent Honda retailer in Phoenix it is our mission to present our customers with reviews authored by the best Honda writers around. Filled with invaluable information and specs, including safety technologies and other info, each passage gives you full access to everything Honda's lineup has to offer. After reading Bell Honda's review of the new Pilot, get in touch with us to schedule a test drive and find out about limited-time dealership offers!